Welcome to our User Portal. This is where you can sign up for camps, classes, pick up games and more. Please sign in or create a new account. 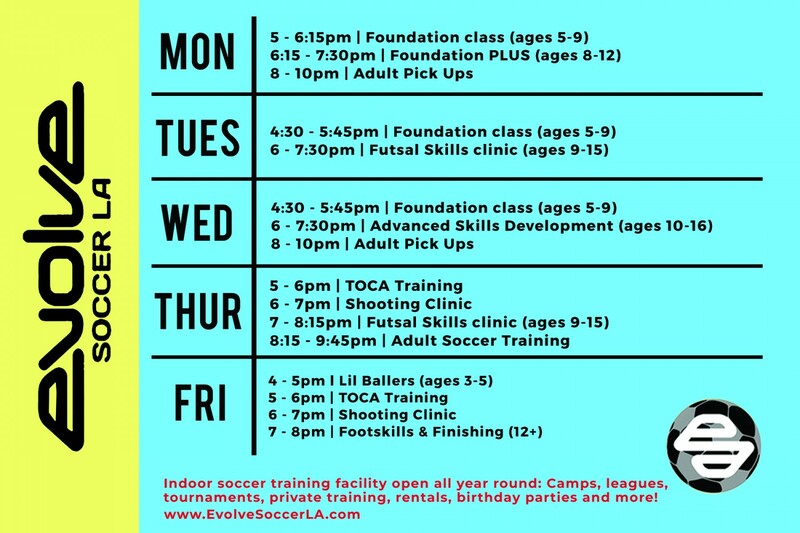 If you have any questions, please contact us at info@evsoccer.com or 213-246-2200. 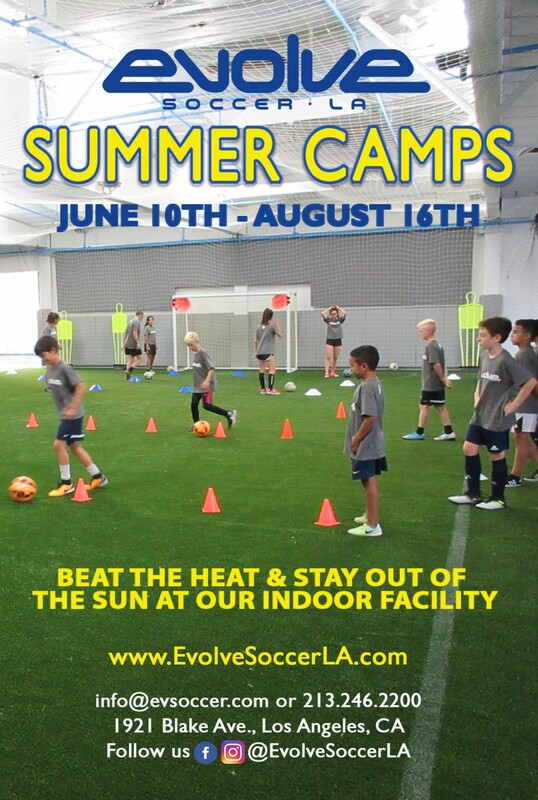 - Summer Camps: June 10 - August 16, weekly full and half day camps. - Regular class schedule ends June 21st, except for Foundation Monday soccer class which will continue throughout the summer. - Evolve will be closed July 4th & 5th. There will be no camps, classes or pick up games on these days. - Regular class schedule will resume August 19th. We will be offering Half Day and Full Day Camps during Summer break and a Single Day Camp on Memorial Day. We have added some exciting new classes to our training program. Check out the full schedule below and enroll today! No cleats allowed, indoor turf or sneakers only. Lil Baller - This program is ideal for kids to learn the basics of soccer. This will help develop coordination, balance, and teamwork. Each class is 60 minutes of fun! Footskills & Finishing - This unique program will teach players a higher level of ball control and technical skills that can be used in tight, high pressure game situations. Players will also learn different shooting techniques; curved shots, lobs, toe pokes, volleys, etc.. as well as 1 touch finishing, 1v1 against the goalkeeper and finishing under pressure. Shooting Clinic - Shooting and finishing at goal is an important skill for players to have in order for teams to win games. Our soccer Shooting and Finishing program will focus on teaching players the technique of shooting with power, accuracy, and finishing at goal in different game time situations. The class will help players be ready and confident for any game time scoring opportunity. Advanced Skills Development - Our Advanced Skills Development Program is for high-level soccer players. Whether they play for a club, AYSO All-Star, Extra program or high school teams, our classes will challenge and develop their skills. Advanced footwork, fakes, feints, and finishing at goal will be some of the subjects taught by our professional coaches. By integrating the dynamics of street soccer and futsal, coaches will introduce some amazing soccer skills that will give each player the confidence to take an opponent on 1v1. Ages 10-16.